The First World War did not threaten the safety of Sibelius, as the battles between the great powers did not spread to Finland. Nevertheless, the war did depress him both in human terms and as an economic disaster. The payment of royalties from abroad was cut off, and he had to scribble dozens of small pieces for Finnish publishers simply to avoid bankruptcy. On the other hand, the composer was no longer haunted by the fear of death. He now dared to smoke cigars, for the first time since his throat operation. He also started to take some alcohol, very moderately at first. A trip to Gothenburg in March 1915 was a rare exception during the war years. The reception he received was excellent: the most important novelty of the concerts, The Oceanides, was immediately appreciated by the Gothenburg audience, although they probably preferred the second symphony. The reviews of the fourth symphony were unenthusiastic. Yet Sibelius was pleased. "I was nervous at the first concert. The second one I conducted brilliantly," he wrote in his diary. The work on the fifth symphony was progressing. On the 21st April Sibelius saw sixteen swans. In his diary he immediately wrote a magnificent thematic sequence, which ended up in the finale of the fifth symphony. "One of the great experiences of my life! God, how beautiful," he wrote solemnly. On 23rd May, Eva gave birth to a daughter, who was christened Marjatta, and Sibelius realised that he was a grandfather. "Strange," was the composer's comment. At home, Katarina was a rebellious thirteen-year-old adolescent, Margareta was almost seven and Heidi four years old. "I always remember the feeling of safety which came over me when I was sitting on his lap," Margareta Jalas said later. During these years, Aino instructed the youngest children herself. They did very well when they started at their school. During the summer the fifth symphony hardly progressed at all. Sibelius was writing small pieces, and he rewrote Sandels for the choir Muntra Musikanter. "I'll soon be 50 years old. I'm poor, so poor that I'm forced to write small pieces," he complained to his diary on the 15th August. The symphony was finally completed for the composer's 50th birthday, on 8th December 1915. The first public performance of the fifth symphony and the subsequent soirée in the hall of the Stock Exchange were major events in the Finnish social scene. At the soirée, Kajanus gave a speech which became famous, claiming that Sibelius had created a distinctively Finnish style of composition. He observed self-critically: "The little that had seen the light of day before that was only a feeble offshoot of the German school containing – if I may use the expression – ethnographically inoculated material from Finnish folk music." Following a nationwide collection Sibelius received a fine Steinway grand piano, but the bailiffs laid claim to it soon after the festivities in Ainola. However, in February 1916, Sibelius's favourite singer, Ida Ekman, brought to Ainola the proceeds of a new collection, which paid off as much as a third of Sibelius's huge debts. 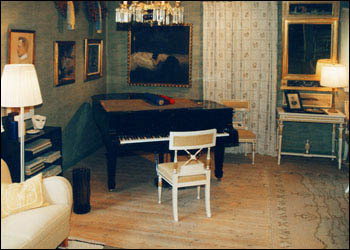 The Steinway could remain in Ainola after all. The fifth symphony with its heroic final notes had come as a relief for the public: it was more readily accessible than the fourth symphony, which was considered difficult to understand. But Sibelius himself was not pleased with his new work and started to revise it at the beginning of 1916. During the summer, Sibelius worked up his symphony. He also wrote several small pieces and music for the play Everyman. According to Jalmari Lahdensuo, who had commissioned the work, Sibelius was now more interested in Scriabin's ideas about combining light and sound. He wanted the music for Everyman to react to the events on the stage in real time, not as separate pieces. This was to be done in order to create "a wider and more practical application of Scriabin's idea of a music that would be perfected by optical means," Lahdensuo later recollected. The first public performance of Everyman was on the 6th November, and Sibelius's music was said to have saved the evening. Sibelius did not make an orchestral suite of the music, which was closely linked to the events of the play. Thus the music became forgotten, even though the play was performed with great success in the jubilee years 1935 and 1965. In the 1990s the quality of the music was rediscovered when a recording made by Osmo Vänskä with the Lahti Symphony Orchestra was issued. On his birthday on 8th December 1915, Sibelius conducted the second version of the fifth symphony in Turku. Now the two first movements had been brilliantly fused into a whole, but the second movement had undergone strange changes and an episode in E flat minor in the finale had been removed. The famous final strokes had been reduced to two final chords. The new version was heard on the 14th December, also in Helsinki. Evert Katila praised the work, but once again the critic "Bis" (Karl Fredrik Wasenius) reacted unfavourably. In his opinion, the merging of the first two movements was not a very good solution, the pizzicatos of the strings in the second movement were tiresome and the dissonances in the finale were exaggerated. Sibelius decided to rewrite the symphony once more. At the beginning of 1917, Sibelius's moderate use of alcohol had again turned into periodic binges, which strained the relations between the spouses. On the 2nd March the family quarrels brought about by alcohol made Sibelius consider a divorce in his diary. "And our life after the divorce! What would it be?" the composer reminded himself. The quarrels receded when the Russian Revolution got even the Sibeliuses excited. The Senate changed its name to the Senate of Finland and freed political prisoners. Sibelius stayed on in Ainola and composed high-quality small pieces such as his Humoresques and the song cycle opus 88. Ainola was gradually becoming empty of children: Ruth had married, and now Katarina moved to Helsinki on weekdays to attend the seventh class of the Coeducational Secondary School. "My heart is bleeding," Sibelius wrote in his diary. Only Margareta and Heidi, his "snow buntings", remained. Finnish Jägers in Libau during the First World War. Towards the end of 1917 the social tensions in Finland were becoming strained to the utmost. Two camps were armed and ready to fight: the Red Guards (often referred to as the "Reds") who supported the Russian Revolution, and the independence-minded Civil Guards (the "Whites"). Sibelius made his own political statement when he composed his Jäger March to the lyrics of Heikki Nurmio, "in a mood of high patriotism". At that stage no one could know that the Finnish "Jägers" – soldiers undergoing military training in Germany – would turn their weapons against the Finnish Red Guards on their return. The original idea had been to receive military training for a fight for freedom against the Tsar's Russian troops. On the 7th November, the provisional government of Russia was overthrown, and V. I. Lenin's Communist government rose to power. Finland expressed its will for independence from Russia on the 15th November, when the Finnish Parliament proclaimed itself the highest authority in the country. The event passed unnoticed by many because of the on-going general strike. The Parliament accepted the Senate's declaration of independence on 6th December 1917. At the same time, Sibelius was sitting in Ainola. "I have symphonies VI and VII in my head. And the revision of the fifth symphony. In case I become sick and unable to work, let this be said," he wrote on the 18th December. Sibelius's year ended in a harrowing lamentation. According to his diary he considered suicide, but decided to hold on for a couple of years more for the sake of Aino and the children. "I haven't heard an orchestra for nearly a year. Neither have I met any people. But - what else could be expected. And Aino is more uncommunicative than ever. Isn't it peculiar that she, whom I love, does not utter a word about the things that are tormenting her. No smile, no laughter for weeks. Everything is greyer than grey. - My whole life has been wasted." The lamentations form part of Sibelius's annual rhythm in the phase of the darkest period of the year, but now the lamentation filled almost one and a half pages. Did Sibelius already sense the horrors of the spring of 1918? The Jäger March was played on the 19th January 1918 at the university's celebration of independence. The right-wing elite of Helsinki were delighted by the work. But the situation quickly changed: on the 28th January 1918, the Red Guard seized power in Helsinki and suppressed the publication of non-socialist newspapers on the very same day. However, at the same time, C. G. E. Mannerheim (http://www.mannerheim.fi/), a former Finnish officer in the Tsar's army, was using his troops to invade the Russian garrisons in South Ostrobothnia and disarm them. Civil war had broken out. The area of Järvenpää was firmly controlled by a section of the Red Guard. Sibelius was placed under house arrest, and there were even a couple of house searches in Ainola. Sibelius's friends wanted him to move to Helsinki: the Red Guard would not necessarily have been able to guarantee the composer's safety in the countryside because of vagrant robber bands. The composer moved with his family to the home of his brother Christian Sibelius, the medical superintendent of Lapinlahti Mental Hospital. In Helsinki there was food rationing because of the food shortage, and in the spring Sibelius lost as much as twenty kilos on his peculiar "cigar diet". Havanna Magasinet & Holländska Cigar Importaffären sold him Brazilian and Cuban cigars throughout the spring. Jean Sibelius after his starvation diet in the spring of 1918. Mannerheim's troops defeated the Red Guard after a few months of bloody struggle, and a parade to celebrate the seizure of Helsinki was held on the 14th April. Six days later Sibelius conducted the Jäger March as a tribute to the officers of the German armed forces, and on the 9th May he conducted an entire concert of his compositions. When things had settled down the family was able to return to Ainola. But Ainola, too, was afflicted by post-war misery: the composer was forced to sell the family's horse. The next work to have a first public performance was Oma maa, which was praised by the critics with customary turns of phrase. As the composer of the Jäger March, Sibelius had become an even greater national hero in the eyes of the victors. Sibelius's life started to resemble the first years of the 1900s: he worked hard and occasionally partied until the early hours. The autumn of 1918 and the spring of 1919 saw a struggle to find the final form for the fifth symphony. The death of Axel Carpelan depressed him, but as a tribute to his friend he immersed himself even more deeply in the work. 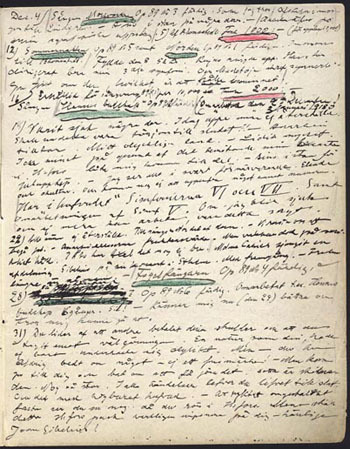 On 22nd April 1919, the revision of the fifth symphony was finished, according to Sibelius's diary, but six days later Sibelius was on the point of changing the work into a one-movement symphony by excluding movements II and III. This thought vanished after a week, and Sibelius rewrote the finale one more time. At last, the fifth symphony was completed. The composer decided to start a new phase in his life, at least externally: he shaved his thinning hair sometime between February and June 1919. He did not yet have the heart to give up his moustache, and in the 1920s he also let his hair grow a little for some photographs. In June 1919, Sibelius and his spouse visited the Nordic Music Days in Copenhagen. It was Sibelius's first trip abroad since the visit to Gothenburg in 1915.
in Copenhagen 1919. In the back row: Johan Halvorsen, Robert Kajanus, Georg Høeberg, Jean Sibelius and Frederik Schnedler-Petersen. In the front row: Wilhelm Stenhammar, Karin Bronzell, Erkki Melartin and Carl Nielsen. In Copenhagen, Sibelius successfully conducted the second symphony, although he would have liked to take the new fifth symphony with him. In late summer Sibelius worked up some small pieces. The first public performance of his cantata Jordens sång took place in October at the inauguration of Åbo Akademi, the new Swedish-language university in Turku. The inauguration was an occasion for heavy drinking, which was not at all reduced by the laws on prohibition. At the social evening, Sibelius played the finale of his fifth symphony on the piano "sometimes singing with the entire strength of his lungs", according to the account of the Swedish journalist Kjell Strömberg. At the end of November 1919 Sibelius gave four concerts in Helsinki, in which he at last presented the final version of the fifth symphony. The concerts were a triumph. Even Sibelius himself considered the ovations "unique". Only a few days after the concert, Sibelius made a colourful appearance at the inauguration of the Art Palace of Gösta Stenman. Sibelius, who was fatigued by the social evening, was restored to conducting shape with half a bottle of champagne. However, during the last weeks of the year, he was again diligently forging the sixth symphony, and the Hymn of the Earth to the lyrics of Eino Leino.